Mark Parsons was born on 25th April 1837 in South Cheriton, Horsington, Somerset, England. He is the son of Meshach Parsons and Elizabeth Hillier both of Horsington, Somerset. He is our 6th cousin 3 times removed,and is descended form Morgan Seymour of East Orchard ,Dorset who died in 1691 in Iwerne Minster, Dorset. I was born at South Cheriton, a small hamlet on the parish of Horsington, on the twenty-fifth of April 1837, and was the eldest child of Meschach and Elizabeth Parsons. Until I was eight years old my life was that of an ordinary child. I was baptized in the Parish Church at Horsington and joined their Sunday School when I was six years old; but in 1845 a Wesleyan Methodist Sunday School was opened at Cheriton so I joined that; there I learnt to read. The same year I began regular work at Hull Farm, South Cheriton for 1s.6d. a week. I was there for eight years, and then I went to Ringclose Farm, Horsington Marsh, for one and a half years at 4s.6d. Cheriton House was my next place, where I stayed five years at 5s. till I was over twenty. Those were hard times, and more than once have seen a fellow boy-worker frighten away the half-mad dog, that he might steal the animal’s dinner. I used to drive out Mrs. Bewsey and fill up my time in the garden and on the farm; I also drove the family to Templecombe Congregational Church every Sunday, but after two years I rejoined the Methodists. At last my master gave up his farm to his son, Mr. John Bewsey, and I afterwards worked for him at his other farm in Yenston. Every night I used to bring the milk from this farm to Cheriton. On one occasion the rector stopped me and said, “Why do you not touch your cap to me?” I answered that if I broke the brim of my hat he would not give me a new one. About three months later he met me again and said “My lad, don’t you know that I am your shepherd?” I said no, that I did not know that he was. “Oh! Yes” he replied, I am the rector and the rector is the shepherd of his people”. I answered, If that is so, you have not been round to see if I had any complaint.” When I reached home I told my mother about the conversation, and it quite upset her. Six Irish “taskers,” whose kindness I have never forgotten. It was very wet on three days of the sixth week, and reaping was impossible; so my uncle went down to the village inn at Wheyley. There he met the Champion Cudgel player of Wiltshire, who challenged him to fight for £5, and this my uncle accepted. My cousin and I were not there, but the master for whom we worked came and told us what was happening, so we went down with him. The two opponents were just mounting the stage as we reached the place; the game began, and at the seventh round, my uncle was the winner. Our master told us it would not be safe for us to stay there, because the people would be so jealous of any one who beat their champion, so he got us all three away quietly. We started off from Wheyley and when we reached Chicklett Bottom we called at the inn. I told the landlord all about it, and he hid us in a loft, and locked the door, putting the key in a hole in the wall where we could reach it from inside. We had not been there more than half an hour when the searchers arrived. My uncle and cousin were asleep, but I was awake and heard them talking down below. After discussing our most likely whereabouts, they came to the conclusion that we must have taken another road, so they turned and went back. I kept awake, and soon as it was daylight I woke my companions, and told them what I had heard. We left at once and passed onto Hindon, where we stopped and had breakfast. We still did not feel quite safe, and travelled on to Mere, and here had a good two hours rest, then made our way to Wincanton and home. The spring before this incident I was with my father throwing timber at Wilkanthroop Corner, when the first train ran on the London and South Western Railway, from London to Exeter. We could see it come out of Buckhorn Weston tunnel from the field in which we were working. Between the reaping and draining time, in the Autumn, I worked in the Market Gardens at South Cheriton. Then I began to be dissatisfied with myself, I felt a longing for something the world could not give me. On October 30 1844, Mr. Silas Dyke preached at Cheriton on “Seek ye the Lord while He may be found; call ye upon Him while he is near.” (Isa. !v. 6). Then and there in the middle of the sermon I came down from the gallery, went up to the penitent rail, and gave all for Christ. I received the conscious pardon of all the past, and the peace of God which passeth all understanding. Six other boys came out at the same time. I at once joined the Wesleyan Church at Cheriton, and it was not long before I had the chance to testify. Captain Bailward’s grandfather, at one time, had me out with him marking timber, and he wanted me to tell him what conversion meant, because he had heard of my decision. I told what it had meant for me, and when I had finished, he said, “If that is conversion, I have never known it; and there are others in higher circles of religious life, Mark, who could not have explained it like that. Two years after my conversion I had a note from the superintendent minister (Rev. Alexander Puddicombe) that I was recommended to be placed on “trial” at the lay preachers meeting, Christmas, 1846. I was two years on trial, taking services all over the circuit (and I always walked), witnessing conversion here and there. At the end of the two years I passed my examination in company with two others, (E. Trowbridge of Holwell and J. Hannam of Sherborne). I was very closely examined on the doctrines of our Church, on the Methodist Second Catechism, and Wesley’s notes. I preached my trial sermon before the minister and three local preachers (G. Strickland, G. Hewlett, and J. Barrett). On Sunday night (before I passed my examination) I was returning home, after taking the service at Poyntington. I reached Milborne Wick and passed three navvies lying down apparently asleep; they were most likely some of those who had been making the double line on the railway. Just as I passed they began to move and mutter to one another, I had not gone far before I found they were chasing me. I at once thought of my watch, so I took my penknife and made a hole in the lining of my trousers and slipped the watch down the leg. They kept gaining for about half a mile, but after that I seemed able to run faster, and they gave up the chase at Stowell Cross roads. Just after this I was at Rimpton, taking a service, I walked from Cheriton, and it was pouring with rain, while the wind was terrible. I got drenched, and several times took off the half Wellington boots I wore at the time and emptied the water out of them. My mother was so anxious that she came to meet me. I was alone on this journey, but as a rule my dear friend, Samuel Smith, was my companion on the way, if he was appointed at some place near. Many journeys did we take together, and hard ones sometimes. Once we had an accident, for when we reached Caundle Marsh the horse fell, breaking the shafts of the trap. I was thrown into a high thorn hedge, and when I looked Mr. Smith was under the horse. I pulled him out, and after cutting the harness we hired a man to take the horse back, we left the trap by the roadside. Then we walked on to take the services. We thought we would be able to get a friend to take us home, but failed; so we had to walk all the way home. Another time Mr. Smith was at Rimpton and I was at Marston when the snow was on the ground. We reached there safely, but coming back we lost our bearings, instead of turning to Milborn Port Down, we followed the Bristol road and found ourselves quite out of our course. Another dear friend of mine was a Mr. F. Fish, who came to live a few miles away, just as I passed my examination. Our names came on the plan together, and we were never apart till he died. As we lived so near one another, we made an agreement that we would never ask a supply for one another unless there was a serious reason for the request, and that if ever the request was made we would neither refuse the other. We kept this promise to the end. One other agreement we made, if ever a Methodist Church was built in Wincanton, Fish and I would give a Bible and Hymn-book. One day, sometime after his death, and after the new Church at Wincanton was started, I was walking in the little back garden of my house. It was a beautiful summer’s day, the air was so peaceful and calm, all at once I heard a voice. At first I thought it was some one on the roof seeing to the gutters, but no one was there. Then it came again, as clear as anything, “Remember your promise Mark” and I knew it was Fish speaking to me. This was on a Friday, and the next day I wrapped up some food and bought a bottle of ginger beer, hiding them in the pig sty. When Sunday morning came I found these things and set off to walk to Wincanton. As I walked up the street I saw the minister come out of the chapel, together with the stewards, I stopped him at once and told him that I intended to give the Bible and Hymn book to the new place of worship. 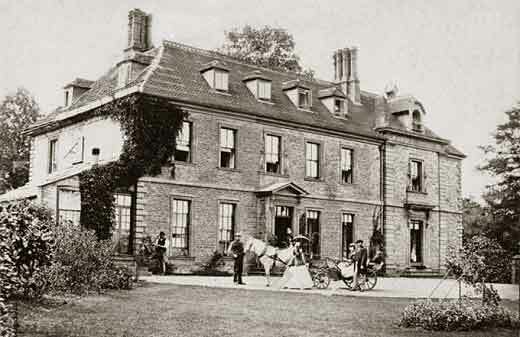 Before the chapel was built at South Cheriton the services were held at Pavlings House, Mutton Hill, the residence of John Pitman. In the summer of 1844 they held an open air service in his orchard; Mr. Smith was the preacher, and though I was quite young, I remember carrying our Bible up from my fathers house. While the chapel was being built, the Rev. Alex. Puddicombe preached on the ground wall. After the new church was opened, for years Mr. Jesse Dodimead from Corton Denham was appointed once every quarter; he always began the afternoon service with the Hymn,”Father of me and all mankind”. His daughter nearly always came with him. She now lives quite near to me (Mrs. H. Collard) Henstridge and whenever I am in that village I know there is a home which will welcome me. In the summer following my examination I went to Wiltshire, a place near Tisbury, harvesting. While I was there the Methodists got to hear of me, and asked me to take a service in that church, but I declined, offering instead to take one in the open air. It was held in the quarries, and I was rather troubled because when I went harvesting I never took my best clothes with me; but though they said they would find me a suit for the service I said I would rather take it in my smock frock. I suppose the novelty of it brought the people, for about three hundred came together in those quarries, and the singing was so hearty. I shall never forget that service, with all those people singing with feeling “Jesu Lover of my Soul” I preached on the Prodigal Son. Just after my examination I was appointed to Holwell, where I met my first wife (Emily Frizzell). In her I found one of the greatest helps that any man could have. Not long afterwards I was seized with typhoid fever, and for three weeks I lay unconscious. The doctor gave up all hopes of my recovery, but in the meantime the Rev. W. Nicholson came over to Cheriton for the quarterly renewal of tickets, and in the meeting he remarked that this was too valuable a life for them to lose, and he called on them to pray that I might be restored. While they were praying the fever took a turn for the better, and I gradually recovered my strength. I was practically quite well when my mother took the fever. She was only ill about a week, she died on June-4-1865. I was married at Sherborne Wesleyan Church, by the Rev. E.Fison. The following Autumn I went to work at Latiford House, where I stayed over fifteen years. My duties were to take charge of the cows, pigs, poultry, dogs and ferrets. One Sunday afternoon the young gentlemen came to me for the ferrets to go ratting. As I always kept them locked up, I refused; then the boys went to their father to complain, but he only said it was no more than he had expected of me. On February-16-1867, my first child was born, a daughter; I had seven children in all, three sons and four daughters. Three are living now, one at Highbridge, one at Street, and one in my own village, who has written all this down at my dictation. During the fifteen years at my last place I lived at North Cheriton; all at once the village day school closed and I did not know what to do with my children. I wrote to the Educational Authorities in London, with the result that a few days later a man came from London who put a notice on the church door, saying the parish must open the school within a fortnight, or the Government themselves would open one. About this time a branch of the Labour Union was formed at Horsington, but I did not join it for six month. And as soon as I joined I was made president of the branch. I held this office till the Union was dissolved. Just before I left Mr. Dendy’s service I lost my eldest son. I was appointed to go to Blackford on the Sunday, and when the doctor told me he could not live I felt so upset that I wandered for two hours in a large field between Maperton and Blackford. I thought “How can God be good to take my boy?” I prayed and prayed, till at last the Voice said, “What thou knowest not now, thou shalt know hereafter” and I was comforted. My father was a road contractor, so when I left Mr. Dendy I worked on the road. At harvest time I again visited Wiltshire, to Monkton Deverill, near Warminster. While there I went to the parish church as there was no chapel. The clergyman was very evangelical, and he must have known what I was, for he invited me to conduct a service on his lawn. Again I was without any Sunday clothes, so I took it in my frock. People from all the adjoining Deverills came and we had a large congregation. I took my text from Acts v.42; “And daily in the temple, and in every house they ceased not to teach and preach Jesus Christ.” I stood on the wall to preach while the people filled the lawn and the village green beyond. When I returned I helped my father make the new road at Horsington, and then the squire at Horsington Manor, Mr. T.H.M.Bailward asked me to come and look after the game for him, as he was out of a keeper. When he got another keeper I “trapped” on the estate for three years, then I worked regularly in his gardens. Though Mr. Bailward was blind, he superintended the garden himself. At the end of seven years he kept a head gardener (Mark Puffett of Wincanton) who was a brother local preacher; but Mr.Bailward still watered and pruned the fruit trees with me. For thirty years, once or twice a week, we rolled the lawns together for him to have exercise. He would never roll them with anyone else. I understood draining well so when he was having the estate drained I used to go round with him, though this often brought me into trouble with the drainers and farmers. We also went over all the farms once a year to see that everything was in order. On these rounds we used to talk of many things which must have been interesting, to say the least of it, as he was a Churchman, I a Nonconformist; he a Conservative and I a Liberal. Sometimes we had very amusing talks, but he always gave every one the liberty of his own opinions, so much so that when the Liberal candidate came to Horsington for a meeting, the chairman failing, the candidate asked Mr. Bailward to take the chair. He refused as he intended going there on purpose to ask him a number of important questions, but Mr. Bailward sugested that I should take the chair, which I did. I was one of the delegates for the East Somerset Liberal Association. In 1886, as I knew the Temperance Society wanted a piece of land on which to build a hall I told Mr. Bailward about it and asked if he could help. He suggested that the Mission Hall would do, with a few alterations, and a small landlord’s rent, but I told him we would rather have some land for our own hall. He said, “I see, you want a house of your own Mark.” Finally I suggested a piece of odd garden, which he did not know belonged to him till I proved it. He gave it to us, and that is land on which the hall now stands. He gave us the deeds free of charge, and five pounds when the hall was opened. He presided at each anniversary meeting and always subscribed. I was now living at Horsington. She was sadly missed, as she was always ready to welcome my brother local preachers and ministers to our home. In 1879 I was appointed class-leader and superintendent of the Sunday School; these duties, with the preaching, Temperance work, and my daily labour, were almost too much for me, but I was enabled to fulfil them. At the time when the Rev. C.H.Cheetham was in the circuit a convention was held at Yeovil for the upper part of the Exeter District. I attended, and there were papers read on various subjects, all parts of Methodist work. I spoke on class-leading, preaching, and the Sunday school, and after the meeting the Chairman of the District, as well as our own ministers, came up and congratulated me. I joined the Horsington Provident and Friendly Society when it first formed, and am still on the committee. When it was started there were only twenty-eight members, now we have about ninety. In September, 1892, I married my present wife. I never had an illness after I had typhoid fever, till December 1907, when I had to go into hospital at Templecombe. The doctor thought an operation would be necessary, but he found it was not after all. I was there three weeks; which included Christmas, and it was one of the happiest times of my life. All the nurses were so kind, and Lady Guest visited us several times. Our minister, Mr Cheetham, spoke of the influence he felt directly he entered the ward; also our good rector visited a number of times, and it was a pleasure to talk with him. The Matron said that my list of visitors quite beat the record. When I left hospital I stayed at home for a week and then returned to my usual work. Just before my illness I lost another true friend, my masters butler, T.Vile. For thirty years we had been close friends; every Sunday morning we made it a point to have a talk about better things, and his death meant a great sorrow in my life. Our superintendent minister (Rev.R.Maynard) presented me with silver Local Preacher’s Medal in May 1909, with the inscription “Valiant for the truth.” How unworthy I felt when he gave it to me. Then my dear respected master died. My duties had endeared me to him for thirty-five years, and life did not seem the same without him. I missed the log walks and talks I had with him. I remember how one morning we went out together, and by and by he sat down to rest. “Read something to me, Mark,” he asked, but I only had a newspaper in my pocket, and was rather timid of the long words; but he would have me read it, and between us we got through. Then he asked, “Who taught you to read Mark?” I told him how all the education I ever received had been from the Methodist Sunday school, and he thought it a splendid thing. I am still working at the Manor for my late master’s eldest son, Captain J. Bailward, for whom I receive great kindness. The gardener and caretaker are also very kind to me. Now I am growing old, I have had visions of the Heavenly City, and when I think that that will be my future Home, it is almost too much for me. You know I am a bit of a visionary. Thought still running in my mind. When I wake up all the chief outline of a sermon is before me, mapped out quite clearly. I take these ideas and work them up and fill them out,--like a farmer who buys cows and then fattens them. Most of my sermons have been made in this way.